When I think of people behind a camera, in my opinion there are two kinds in the world. One is this person on a hair-trigger – put them behind a camera and point and they will shoot unhesitatingly. It is as if the shutter button has been programmed and connected to their synapses and all other reflex muscles that lead to that action of clicking are all so finely interconnected together that the click is an inevitable lightning-quick conclusion. The second is this “I must recognise what I am doing” types. They take their time to first become familiar with what they are clicking. It might be something like, “Ah, this is the Black-headed Shrike-babbler and is not a subject I have seen through the view finder before”. Or, “Wait, this one doesn’t seem familiar. And I am not able to recognise it and hence could be a lifer. Let me shoot a few pics and then figure out what this bird is”. 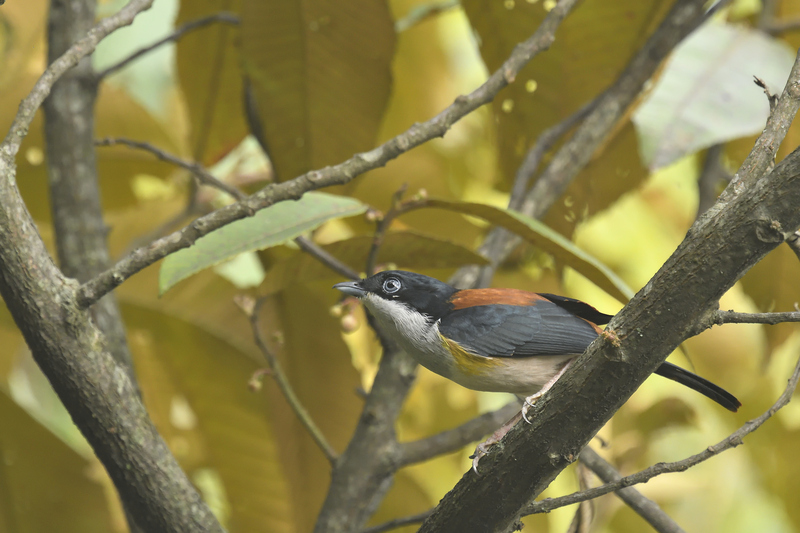 The strikingly handsome Black-eared Shrike-babbler. There are 5 species of Shrike-babblers in India and every one of them is as strikingly pretty as the other. And what’s more, the female of each species is beautifully patterned as well.